Fear not! We have TEN boredom-busting ideas to transform THIS snow day into a fun-filled day of science experiments! Find a mirror, piece of glass, or acetate sheet and chill it in the freezer or outside. Once chilled, use hairspray to cover your catcher with a light, even coating. Use clothespins or binder clips to attach the glass or acetate to a piece of cardboard, as insulation and to protect your catcher. Go outside and catch snowflakes on the glass. Now place the sheet under a cardboard box or other protective shelter. As the snowflakes evaporate, they will leave behind their impression in the hairspray, which you can view with a magnifying glass! You can even identify the snowflake types using this handy chart. Want to save your snowflakes forever? Try this method! Challenge your kids to use their creativity and science knowledge to help a snowball survive inside for a as long as possible. Have them make snowballs and put them into plastic sandwich bags. One should be left on the counter as is, to act as a control. You can leave one outside to see what would happen to the snow ball in its natural habitat. You can put one in the freezer and one in the refrigerator as well. As for the others, think about the best ways to insulate them — try plastic bags, bubble wrap, crumpled newspaper, fabrics, etc. This experiment is based on a classic Mythbusters episode: Cooling a Six Pack (#29). In it they try to chill beer to 40 F using a variety of methods, including burying the six pack in sand, pouring gasoline over it and lighting it on fire. (Spoiler: That method was totally busted.) Now, I’m not suggesting you set anything on fire, but you can test one of their methods easily. Grab three coolers, bins, or bowls that are large enough to hold a can of soda (or a juice box, whatever). If using an uninsulated container, wrap it in a towel to help keep it cold. Fill one container with snow, the second with snow and water and the third with snow, water and salt. Use a thermometer to check the temperature of the soda at room temperature. Once you’re set up it’s time to let the race begin! Start by making a prediction as to which scenario will win. Add a can of soda to each of the chilled containers. (I open each and carefully place it in the bin, so that it is easy to check the temperature.) Check the temperature of each every 5 minutes until one reaches 40 F! If you want to try several liquids or compare liquids in glass or plastic, those are great ways to extend the learning. BTW, here’s an explanation as to why the results are what they are. Here’s a really easy one: Give your child an ice cube and piece of thin string (unwaxed dental floss or thread, for example). Tell them that they need to put up the ice without using their hands. Only the string can touch the ice. Yea, good luck with that. As the ice melts it gets slippery and you can’t get the string around it. Argh! Now drape the string over a fresh ice cube and sprinkle on a little table salt. Give it a moment and then pick up the string. The ice cube sticks! Neat trick! The salt melted the ice just enough to form water, into which the string sinks. But the ice refreezes that water, encasing the strong in the cube. Use a nail to punch three holes spread along the top edge of a clean coffee can. Tie a 18″ piece of string to each hole, then join them together on the unbound end. Using the nail, make a small hole in the center of the bottom of the can. Congrats, you have an icicle maker! Take the icicle maker outside on a cold day and fill it with water. The water will drip slowly though the hole, building an icicle over time. 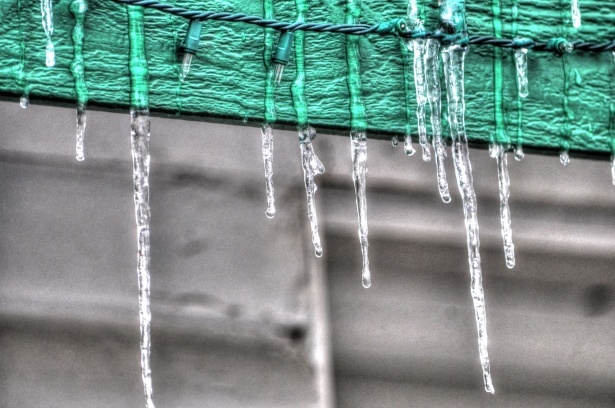 This is the same process that make natural icicles as well as stalactites! For a sweet treat, add a bit of maple syrup to your water for an all natural popsicle! If you have freshly fallen, clean snow, you can use it to make an easy treat. Just mix together about a gallon of snow, 1 cup of sugar, and 2 cups of milk. Flavor it with vanilla, chocolate syrup or a packet of Kool-Aid. Voila! This may not be a creamy gourmet confection, but it is a ton of fun! Ok, yea. Not a lot of science there. But measuring out the materials is great math practice for young kids. Try halving or doubling the recipe for extra work with fractions. Put the salt’s temperature lowering powers to use at snack time! In a quart sized ziploc bag place the following ingredients: 1/2 cup half-and-half (or milk, with the highest fat content possible), 1 tablespoon of sugar and 1/4 teaspoon of vanilla. Seal the bag well, pushing out as much air as possible. Place that bag into a larger gallon sized ziploc bag. Add snow or ice to fill the bag about half way. Then add about 6 tablespoons of rock salt (the kind you use on your driveway). Push out the air and seal it all up. Now shake it, toss it around, and generally get the bags moving. The salt and snow mixture will drop to about 14 F, cold enough to chill the milk mixture and create ice cream! 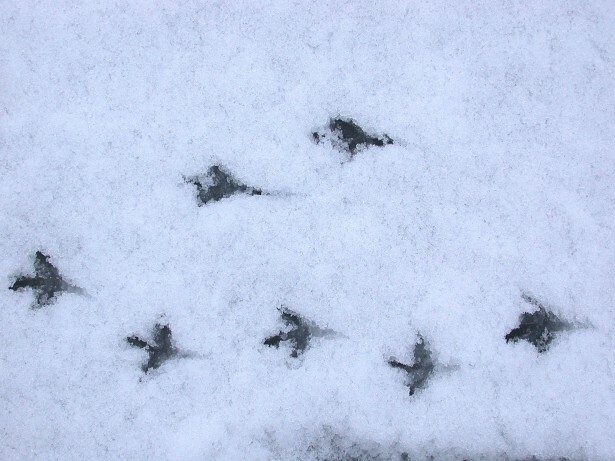 A fresh carpet of snow is the perfect background for animal tracks of all kinds. So grab a guide and a camera and start looking! If you have a birdfeeder, you’ll likely find lots of bird prints as well as little squirrel tracks. Domestic animals like cats and dogs are easy to find as well. Deer tracks are also fairly common. You may get lucky and find a raccoon, skunk, rabbit, oppossum, or fox track as well. Ever wonder why walruses, seals, whales and other cold climate creatures tend to be hefty? They need that layer of fat to stay warm. You can recreate the experience really easily. Place about a cup of vegetable shortening into a ziploc sandwich bag. Gently push a second bag, turned inside out, into the first, centering it in the fat. Join the zippers or tape the two bag edges together. Now place your hand into the inside bag and pick up some snow. The fat insulates your hand, keeping it toasty warm! Blow up a balloon inside, then place it outside on a cold day. Does it stay inflated? What happens when you bring it back inside? Take a clear plastic cup or disposable water bottle outside and fill it to the top with packed snow. Bring it inside and let it melt. Do you still have a full cup? Use a marker to make a line at the top of the water that formed. Place it back outside or in your freezer to refreeze. Do you still have the same amount? If you fill a disposable water bottle to the very top with water, cap it and freeze it, what happens? Why? Solids, liquids and gases all experience volume changes with changes in temperature, as shown most clearly with the balloon As the air cools, the molecules move less and come together, condensing. As a result the balloon deflates. Bring it back inside and the heat (energy) gets the molecules moving again, spreading out to fill the balloon. 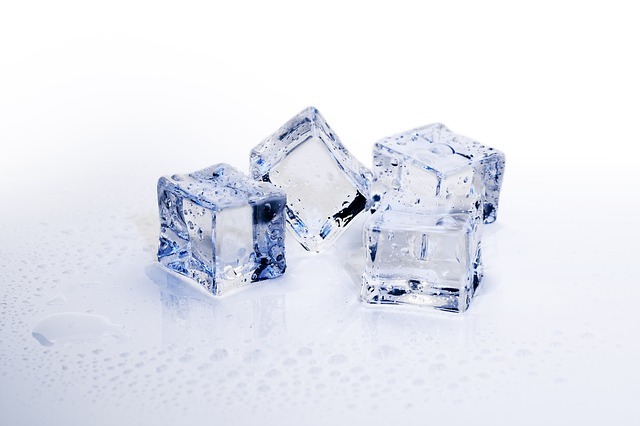 Most materials condense when they get cold and freeze. Water is a special case. It is the only substance that expands when it freezes! In the case of snow, it is mixed with a lot of air as well, so when it melts, the water left behind has much less volume than the snow had. But when you refreeze that water, it will take up more space, rising up in the cup. If you fill the bottle all the way and freeze it, you will likely pop the cap or crack the bottle as the water expands during freezing. Make the day more colorful by filling an old spray bottle with water and food coloring. 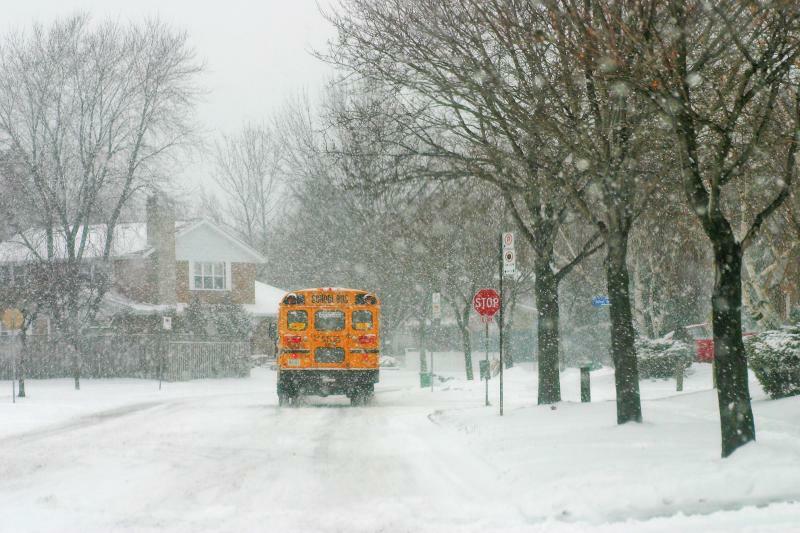 Then head outside to to make all that white snow into a work of art. Try placing found objects, like branches, against the snow and spraying color over it to create negative space shapes. Want a washable option? No problem! Collect old washable markers from your art bin. Using pliers, remove the back of the marker and turn to upside down to retrieve the felt wick inside. (You may need to tap it or use needle nose pliers to get the felt out.) Place the whole felt right into some warm water in your spray bottle. The ink will leech out into the water, creating a great spray paint. Highlighters work really well too! This is a great chance to practice color mixing with young children. Whatever you choose to do, make the most of your snow day. Right now it may seem like a hassle, but these days are gone too quickly.